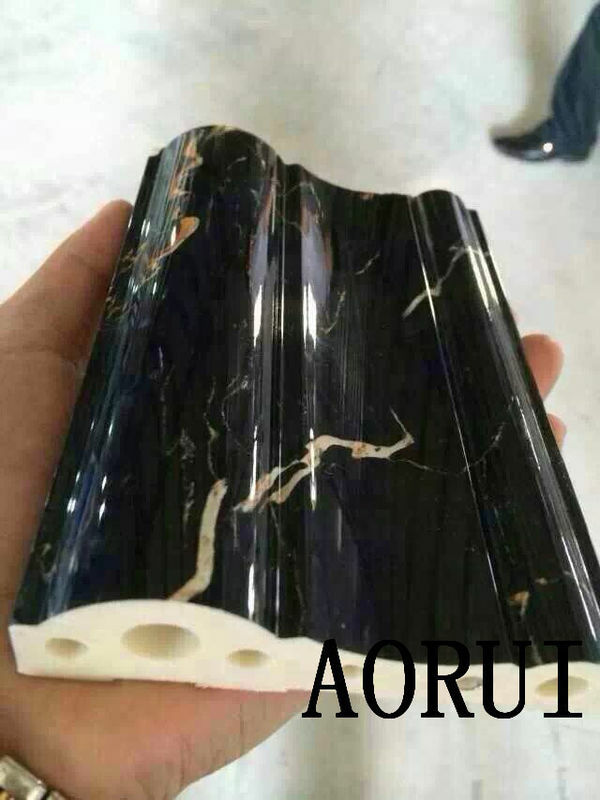 PVC imitation marble profile widely used for decorative,such as waist line, door window line, sunshade arc, stair lintel, publicity column frame, frame lines, etc., can be used in high-grade hotels, shopping malls, residential, villa, KTV etc. Building decoration.If you're going to be hone or business place luxury building decoration, imitation marble lines are good options. Grain is clear and beautiful, super wear resistance, surface brightness and not smooth, and environmental protection non-toxic, abrasion resistance, scratch resistance, also can prevent slippery, waterproof, fire prevention, long service life can reach more than 20 years. (3). Waterproof, moisture-proof, water is not deformation, non slip PVC material,strong anti slippery , can eliminate the elderly,children's anxiety. 1. PVC imitation artificial mable is wear-resistant. 2. green environmental protection, non-formaldehyde,non-toxic harmless, non radioactive pollution.